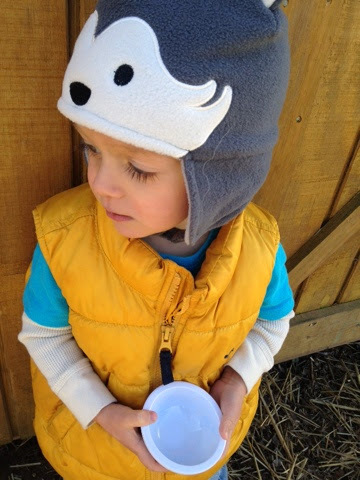 Even though it was a beautiful Spring morning, Ayden insisted on wearing his husky hat and vest out for our chicken chores. 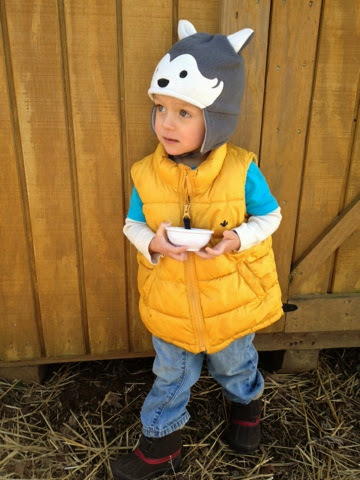 He wanted to wear his mittens too but I was able to talk him out of those. The boy is stuck on Winter. He can carry one egg in it without it rolling around. Speaking of being stuck on Winter... We got Ayden the Frozen DVD! David had some house design work to do (now that things are in motion it is crunch time!) so we set up a comfy place for us to watch on the lap top in the office so we could all still hang out as a family on family night. 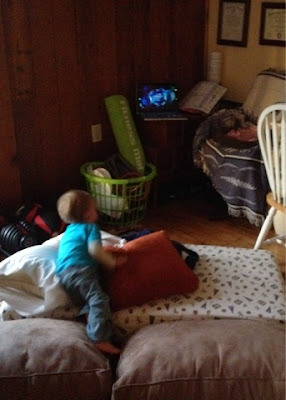 We brought up Ayden's crib mattress along with a couple of couch cushions and throw pillows. Ayden thought it was the most fun thing ever! Funny how something so small can seem like the coolest thing int he world to a kid. He likes to sit with his little hands clasped. Ayden didnt' get to bed until 9:30 but it was worth it! I'm sure he will enjoy many more late nights this Summer. It's kind of what it's all about, isn't it?? Do you let your kiddos stay up late for some extra fun every now and then? And two years ago today: "2 Months Old"
I'm curious what you think about screen time for kids. How old was Ayden when you started letting him watch movies and do you think there is a negative impact? I haven't let my toddler have screen time yet but It's hard to stick to that. Hi! 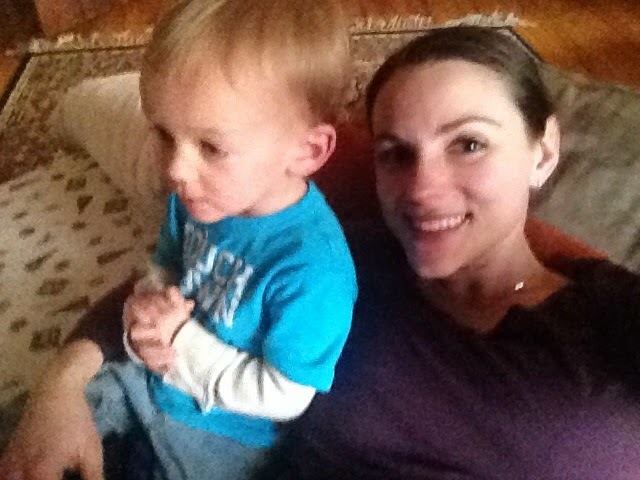 We did not give Ayden screen time at home before he was two. When we were at other people's houses, say for sporting events and such, we were a bit more relaxed. When he was a few months shy of two we started having family movie nights. (we chose the age of two as our cutoff because it is the age that the AAP suggests waiting for http://www.aap.org/en-us/advocacy-and-policy/aap-health-initiatives/pages/media-and-children.aspx ) Since he turned two, at home we limit screen time to weekends only and stick to G rated movies (to avoid commercials) and we always watch with him to guide the experience. We have not introduced computer or phone games to him, though he has seen other kids playing theirs upon occasion. The rules we have in place are actually more for us than for Ayden since we can see ourselves easily increasing screen time over time. Keeping things kind of black and white really helps keep us reined in from the all powerful technological spiral. During the week, we like to challenge ourselves to keep him occupied/engaged independently through hands-on, real world activities rather than using a screen. On the weekends we are a bit more relaxed about it because relaxing is what the weekends are all about and cuddling up for a family movie is very relaxing. You are right, it is very hard. Perhaps I will write a post on this topic. Thank you for reading and commenting :).